On a clear day at 71 Above you can look out the wraparound floor-to-ceiling windows and see Catalina Island, a gray outline rising from the Pacific, on one side of the room. On the other, the San Gabriel Mountains look close enough to touch. 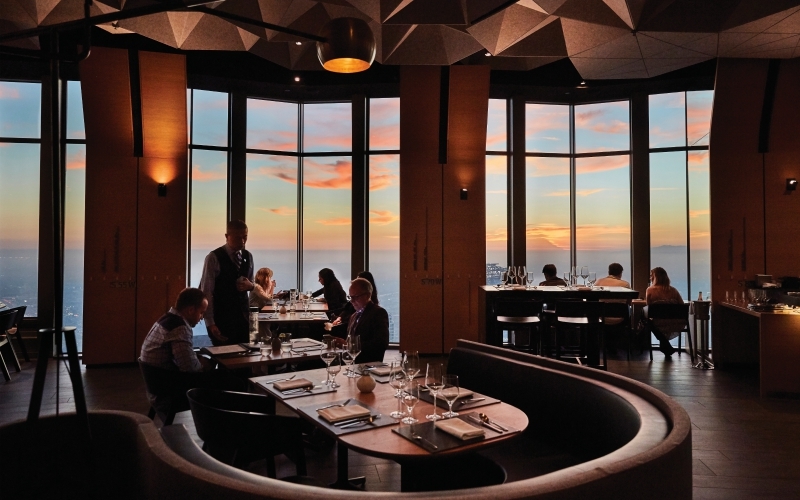 But while the 360-degree views are the star attraction at the restaurant, which opened atop the U.S. Bank tower in 2016, don’t underestimate what’s on the plate: Vartan Abgaryan lends an intimacy to special-occasion dining with dishes like foie gras terrine dotted with cider gastrique. It wasn’t always this way. (Who hasn’t been to a coastal spot where food is secondary to the real estate?) Luckily, these days in L.A., striking locations and great food aren’t mutually exclusive. At Redbird, situated in the elegant former rectory of St. Vibiana Cathedral downtown, you can look through the retracted ceiling, past the Baroque bell tower, and see 71 Above from another vantage point while slicing into Neal Fraser’s veal chop. It might well be the most urbane dinner setting in L.A.
Not that urbanity has to be fancy. At Salazar, which sits on a gritty stretch of Fletcher near the L.A. River in Frogtown, sipping salt-kissed margaritas alongside a few of Jonathan Aviles’s chargrilled carne asada tacos in the restaurant’s palm-dotted yard feels as L.A. as it gets. Of course, when you’re talking about eye-catching dining spaces, it’s impossible to leave out the patio at Michael’s. When Miles Thompson took over the kitchen of the iconic Santa Monica restaurant in 2016, he had a tall order: Honor its storied past as a pioneer of California cuisine while also making it fresh. Thompson’s cooking has soared. Eclectic dishes (grilled octopus with a Sichuan peppercorn marshmallow) keep the space, surrounded by lush foliage, as relevant as ever.